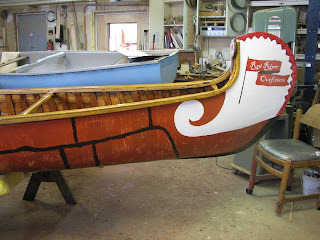 I came across this offering from Nova Craft canoes. 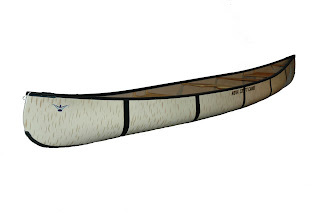 I have no real problem with someone making a canoe that is supposed to look like a birchbark canoe, but would it kill someone to actually LOOK at a photo of a real birchbark canoe? There is so much wrong with it, don;t get me started. I'm sorry, it's a bit of a sore point as it happens so often. I did this to an old canoe a few years ago, prepping it for a screen appearance. 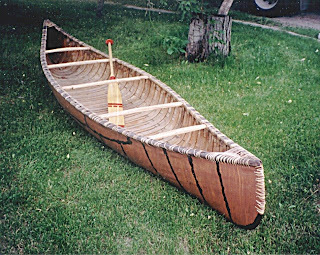 This is what an imitation birchbark canoe should look like, if you've ever bothered to look at a real one. Posted by Doug Ingram at 11:39 p.m.